Etched by JMW Turner and engraved by Charles Turner (no relation), this print was the third plate of the artist’s Liber Studorium, a series of landscape prints intended to advertise his range. 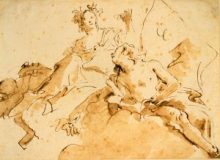 The production of which caused a disagreement between Turner and his original engraver. 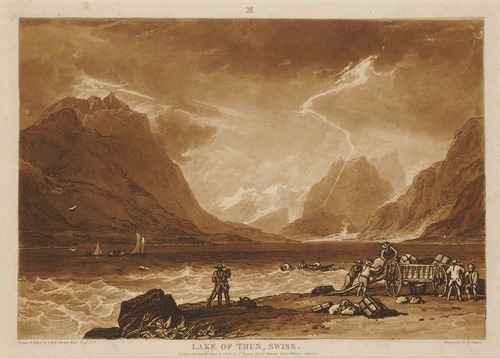 It shows an electric storm over Lake Thun in central Switzerland, which he witnessed while on tour in 1802. The medium of etching brilliantly conveys the drama of the moment, allowing a sharp contrast between the dazzling lightening, the stormy darkness of the mountains and the overcast waters. On the lakeside, the men are feverishly loading their cart to return to the safety of home, whilst the man holding a gun adds a sinister note to their activities. In contrast to the tone of ‘Ludlow Castle’ (Inv. No. 42.8) the threatening atmosphere introduces an element of hostility in the relationship between man and nature, emphasised by the boat rocking upon choppy waters. The print is probably a response to public interest in the Sublime, both in literature and art.